There’s no party like a Mardi Gras party and, if you can’t make it to New Orleans, there’s no better place to celebrate than at Secrets Hideaway Resort and Spa. Dazzle and shine this Saturday night as you join all your sexiest friends for fantasy filled evening of masqueraded merriment. Get ready to unmask your excitement and make some merriment for the biggest party in the nation. 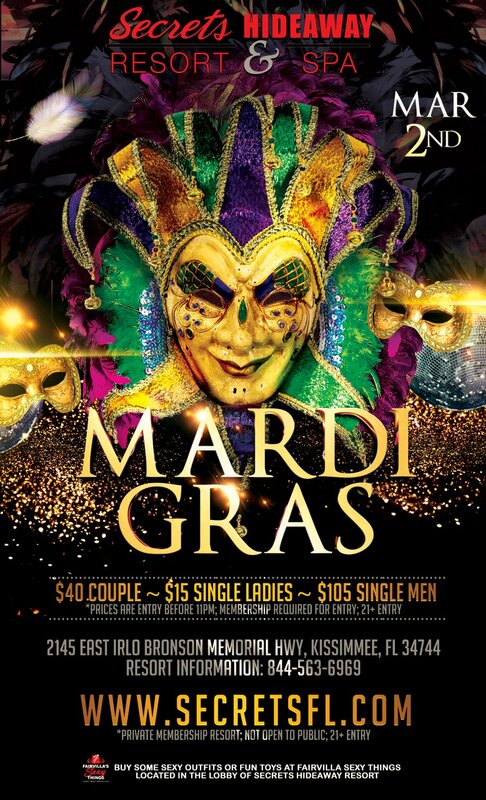 This Saturday night, we celebrate Mardi Gras, Secret’s style! Grab your shimmer and get to the resort early for happy hour specials at our outdoor tiki bars. Meet new friends under the stars, grab a bite to eat from our full dinner buffet, and prepare for an evening of unforgettable adventures. With a huge dance floor, two bars, a professional sound system, and multiple dance poles, Club Secret is the perfect backdrop for this mischievous celebration. With two luxurious spas, heated conversation pool, and group shower you’ll be set to get cozy with your friends and create your wildest secrets yet!